To say that I am excited about The Great Gatsby movie is a huge understatement. Art Deco architecture and fashion have always topped my style list, and I've always been a huge fan of F. Scott Fitzgerald's The Great Gatsby, even when it was required reading in college. Perhaps it was his apt accounts of the epic parties and grand fashions of the twenties, but the story that intertwined the opulent atmospheric descriptions made the whole era seem even more mysterious and elegant. Leave it to visionary film maker Baz Luhrmann to amp my excitement up even more with the debut of his film adaptation, coming to theaters on Friday. From the very first glimpse at a trailer for the movie, it's clear that the fashion in this film will be as legendary as Gatsby himself. Baz Luhrmann turned to Miuccia Prada to design the over 40 bespoke costumes for the film. Prada then pulled inspiration from her own archive to update and revitalize flapper-era fashion. I love fashion sketches as they tend to shed light on the thought process and musings of a designer at work. 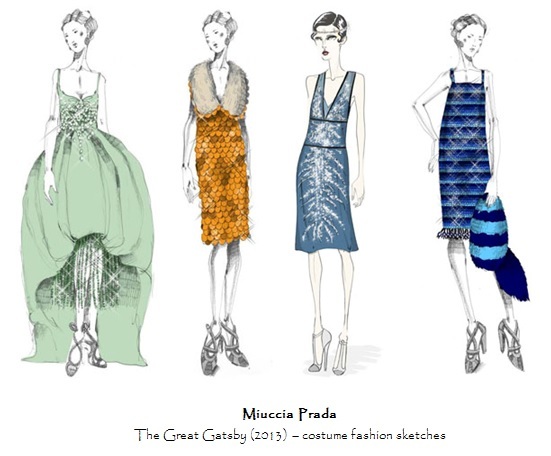 The recently released sketches above show Prada's initial ideas for costuming the film. On the recent runways I've noticed many other fashion houses who have showcased an opulent twenties influence in their pieces. At Naeem Khan, the entire collection seemed to be a nod to the twenties, with sparkling beadwork and deep hues. Vanessa Bruno showed a modern update to the angular designs with a mini dress in an Art Deco print. The sheer paneling that Elie Saab is famous for was highlighted with embellishments mirroring prohibition-era geometric motifs. At Sao Paulo fashion week, Adriana Degreas showed Gatsby-inspired resort wear with plunging necklines and beaded caps. Emporio Armani's accessories really gave his contemporary pieces a twenties touch with hats perfectly fit for Gatsby character Daisy Buchanan. At Louis Vuitton, modern flapper-girl style was evident in the hair and makeup as well as the feathered and beaded detailing shown on the jumpsuit above. I will definitely be working Art Deco fashion influences into my wardrobe in the coming seasons. Does Gatsby fashion inspire your style?